Easter is just around the corner and my two are not really in the mood for our normal learning activities but we have found that even when we have our “breaks”, maintaining a little bit of a rhythm to our day helps my two SPD kiddies. So I tend to exchange our normal learning activities for more themed activities and we tend to do them around the kitchen table often with some fun snacks (yes chocolate was consumed). It seems to work better for us than a complete break. I thought I would share some of the Easter themed puzzle type pages that we have used from Activity Village. As always word searches (my kids always enjoy a good word search and I LOVE word search pages as I have seen with my oldest how much they help her spelling). Same thing with the Easter word scramble – I Love words scrambles – writing and spelling practice. The kids also loved the idea of the Easter How Many Word Page – they had to see how many words they could create with the letters in Easter Egg – we did this as a family page – all three of us together – my kids said I needed to add that this page works better if the kids get to eat an easter egg while thinking of the different words. And another old favourite with my two is the alphabet search page – although I must admit we did struggle a bit more with finding Easter themed words (we have found other alphabet searches a bit easier than this one) so we have attached ours to a clip board and given ourselves the challenge of coming up with all the words by the end of the week. They also have some lovely looking maze pages, I am keeping the maze pages for later on this week. 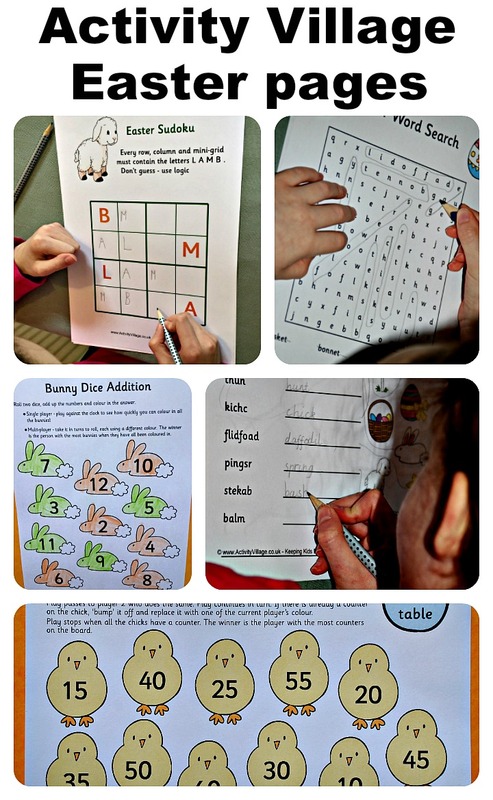 This entry was posted in Homeschooling and tagged activity village, Easter, home ed, home education, homeschooling, sudoku, Times table, word puzzles. Bookmark the permalink.